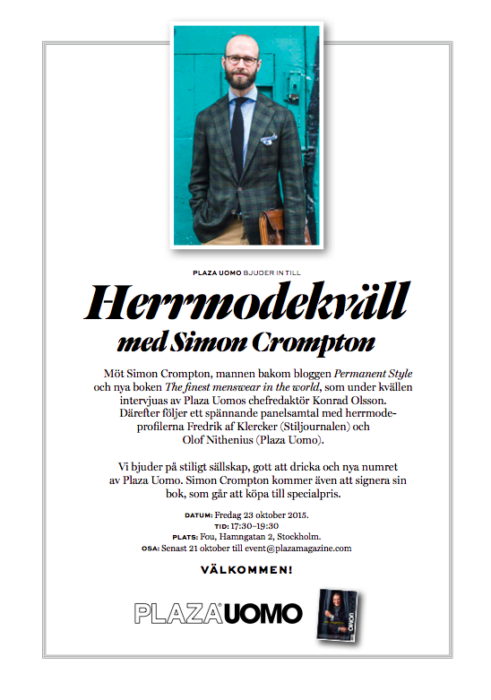 Next week in Stockholm, Plaza Uomo magazine is holding an event to launch my book ‘The Finest Menswear in the World‘. There will be an interview on stage, book signings afterwards, and some coverage to feed back to readers elsewhere. If you are located in Stockholm and would like to come – or can travel in from elsewhere in the region – please let me know (usual email address) and I will put you on the guest list. Looking forward to meeting everyone in Stockholm. You can follow the discussion on Launch party in Stockholm by entering your email address in the box below. You will then receive an email every time a new comment is added. These will also contain a link to a page where you can stop the alerts, and remove all of your related data from the site. To bad I leave for the southern parts of Sweden on the 21st! I would have loved to come. Enjoy our beautiful capital. Will you come to Paris for a book launch ? Simon, I am VERYvdissapointed that you are not answering my recent E-Mails regarding the issue with my recently bought book. Before I ordered the book you answered within 24 hours, now that I have recieved it you are not answering within WEEKS. I’m afraid I’m not sure what you are referring to. I haven’t seen any emails from you. It’s obviously not easy keeping track with 500 people asking about book timings and dedications, but I’ve searched through my emails and can’t see anything else from you.